Mummified alien skeleton? An alien skeleton discovered 15 years ago in Chile’s Atacama Desert has been further analyzed – giving us a solution to this intriguing mystery. 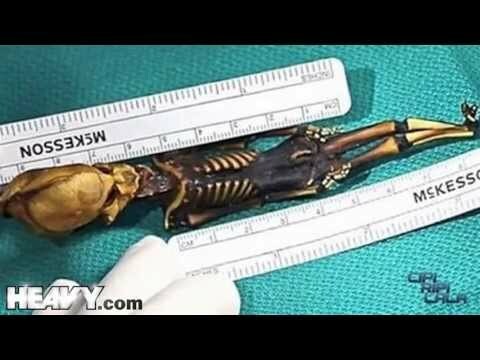 It turns out that the Mummified alien skeleton discovered back in 2003 isn’t alien after all, but at a glance, it certainly looks otherworldly. Although the skeleton is only 6 to 8 inches tall, analysis of the bones suggested the alien skeleton would have belonged to a child of 6 to 8 years. The long, angular skull and slanted eye sockets didn’t look human, and the 10 pairs of ribs rather than 12 further perplexed scientists that sought an answer to the mystery behind this alien skeleton. Immediately following the discovery of the Mummified alien skeleton, dubbed Ata, many were wondering what the story behind this alien skeleton actually was. Featured in several TV shows as well as a documentary called “Sirius” by a UFO researcher attempting to find out more about the alien skeleton, there was no conclusive evidence as to the origins of this bizarre specimen – until now, that is. The widespread attention around this alien skeleton – a specimen originally discovered in a desert mining town called La Noria in the Atacama region of Chile – piqued the interest of Gary Nolan, the senior author of the new story that sheds light on the origins of Ata, and a professor of microbiology and immunology at Stanford University. Nolan was interested in Ata for several different reasons, including the fact that it could be some sort of previously undiscovered primate species, a type of human deformity, or even something we hadn’t even seen before. He didn’t for a minute, however, believe it to be an alien skeleton. The answer to the problem of the Mummified alien skeleton was DNA analysis. A sample was extracted from the bone marrow of Ata’s ribs, and then used to conduct a sequencing of her entire genome. The results were compared with both primate and human genomes, and it turned out that this Mummified alien skeleton was, indeed, human. As mentioned above, the bone age was originally estimated to belong to a skeleton between 6 and 8 years of age, but it turns out that Ata had a bone aging disorder that made her seem much older than the person they actually belonged to. The team then moved forward to taking a closer look at the genes. The main aspect that Nolan hoped to discover was why, exactly, this Mummified alien skeleton was so small, as well as why the skull was strange and ribs were missing. Astonishingly, there were mutations within seven genes. While that’s not abnormal by default, the combination of these mutations created a plethora of musculoskeletal deformities, such as scoliosis, and skeletal dysplasia – more commonly known as dwarfism. The combination of all of these mutations is incredibly rare, and the scientists believe that no one has ever explained all of these symptoms in a single patient before. The question then turned to what exactly would cause these issues, and Nolan and his team believe that Ata’s environment may have been the main contributor to her deformities. As an Mummified alien skeleton found in an abandoned mining town, exposure to nitrates may have caused the issues – that is only speculation at this point, however, and it’s still unclear what exactly gave the appearance of an alien skeleton that stumped scientists for 15 years. While this didn’t end up truly being an Mummified alien skeleton after all, it certainly gave that appearance for quite a long time. A rare combination of genetic mutations had many claiming that there was some sort of extraterrestrial experience, but this goes to show that there’s often a rational explanation for mysterious occurrences – even if it isn’t readily apparent at first. There very well may be some sort of extraterrestrial life out there – perhaps even interacting with us from time to time – but Ata is simply a child with unfortunate deformities, rather than a true alien skeleton.